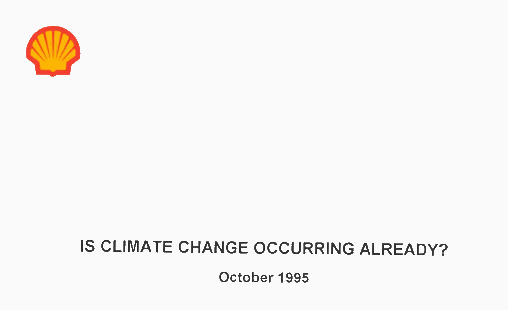 This is a 1995 analysis by Shell International B.V. scientist Peter Langcake of whether climate change was in fact underway and if, as some scientists were suggesting, a “signal” had been detected showing human influence on climate from temperature, weather, polar ice melt and other data. This document is a part of a larger collection unearthed by Jelmer Mommers of De Correspondent in a trove of internal Royal Dutch/Shell Group (“Shell”) documents. Langcake’s study is framed in part by industry’s fear of stringent greenhouse gas policies proposed in the wake of the Rio Climate Convention despite what he claims is inconclusive evidence that anthropogenic warming has yet been detected. Updating a 1994 Shell report that considered human-caused warming as a possibility, Langcake contrasts the company’s research with the Intergovernmental Panel on Climate Change (“IPCC”) Second Assessment, new scientific studies, and media reports, drawing stronger conclusions that global warming is linked to fossil fuel use. Isolating the anthropogenic climate change “signal” from the noise of natural variability is inherently difficult, says Langcake, and the result can only be expressed as a probability. Any claim that the signal has been detected will be controversial. Since experimentation with the earth’s climate is impossible, statistical models that try to tease out various influences are the only available tools. Langcake finds that one study deducing warming from changes in the timing of the seasons fails to prove these variations are caused by CO2 build-up and is too narrowly focused on CO2 to the exclusion of other atmospheric compounds. Langcake offers the counter-influence of sulfate and other aerosols as a reason why greater increases in global temperatures predicted by some models failed to materialize – a theory backed by work at the Hadley Centre in Great Britain, but warns that may just represent tinkering with the climate model to make it square with the historical record. Aside from David Thomson’s seasons study, the Shell report deals only in passing with a considerable emerging body of opinion and evidence that human-influenced warming was already a reality. Langcake points only to the opinion of a director of the reinsurance firm Munich Re and a publication by Greenpeace’s Jeremy Leggett as representatives of this view. This view is unsupported, he says, by data for the past hundred years analyzed by the US National Climate Data Center that captures information on rainfall, drought and other indicators and found that only the last few decades showed signs of more extreme climate, not a long-term trend. He finds no strong support for global warming even in the IPCC’s most recent report due to limited data. The strongest evidence in support of climate change is the melting of the polar ice caps, Langcake acknowledges, noting the temperature in Antarctica rose by 2.5 degrees centigrade between 1945 and 1995 and a Norwegian study supporting the idea of a rapidly accelerating melt at both poles, but claims this theory may not be borne out over a longer period. Langcake writes that strong indications of human-caused climate change will probably emerge gradually and undramatically over time, guaranteeing that any detection of a clear “signal” will be controversial. Only over time, he says, will it become clear how to isolate the background noise of other factors from the effect of increases in man-made greenhouse gases – and there is no telling how long that will be.